Geneva/Nairobi/Vienna 25 May 2016: Illicit wildlife trafficking has gained significant international and national attention over the past five years in response to a recognition of the severe impacts it has on development, the environment, people and their livelihoods and in some cases national economies and security. A global collective effort is underway to tackle illicit wildlife trafficking, and several targeted efforts of the United Nations to further support combating these crimes are coming together around a series of events in the lead up to the World Wildlife Conference – or CITES CoP17 – to commence in Johannesburg on 24 September 2016. 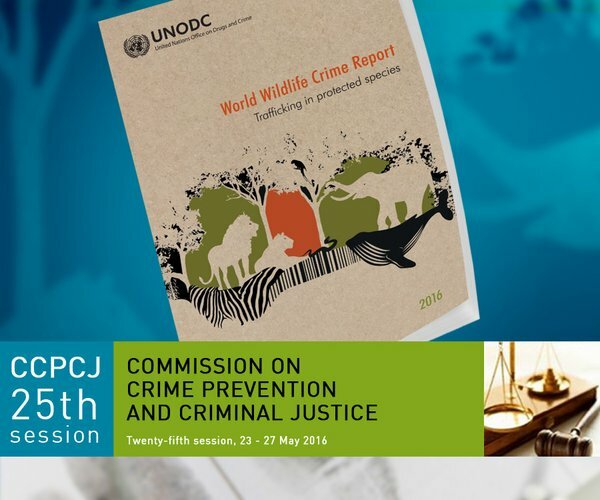 At the UN Commission on Crime Prevention and Criminal Justice meeting in Vienna on 24 May, the Executive Director of UNODC, Yury Fedotov, with John E. Scanlon, Secretary-General of CITES, launched the first ever World Wildlife Crime Report. This is the first attempt at analysing the scale and nature of illicit wildlife trafficking at global level by drawing upon the best data, case studies, and deep analysis. "The launch of the first ever World Wildlife Crime Report shows that the response to wildlife crime is coming of age. This comprehensive global report is rooted in the best data and case studies available, is backed by in-depth analysis, and demonstrates a heightened sense of rigor in the way in which we report on wildlife crime” said John E. Scanlon, Secretary-General of CITES. Future reports will benefit from more and better data, with CITES Parties to submit annual illegal trade reports starting in 2017. Hundreds of additional species of animals and plants, including 250 tree species, are being considered for global protection under CITES at its 17th meeting of the Conference of the Parties - to be held in Johannesburg later this year (CoP 17). The World Wildlife Crime Report shows the extensive involvement of transnational organized criminal groups in these highly destructive crimes and the pervasive impact of corruption, demonstrating that combating wildlife crime warrants even greater attention and resources at all levels. “We sincerely thank the Executive Director and staff of UNODC for leading this tremendous effort, together with our other ICCWC partners, namely INTERPOL, the World Bank and the World Customs Organisation” added Scanlon. Mr. Scanlon was also invited to address the Commission on the strengthened relationship between CITES and UNODC and the UN Conventions against Transnational Organised Crime and Corruption in tackling illicit wildlife trafficking, where he noted the complementarity and strong synergies between the three Conventions, including combating the transitional organised criminal groups behind these highly destructive crimes and the corruption that is enabling them. Later in the week UNODC will also be releasing the Best Practice Guide on Forensic Timber Identificationon forensic best practices and procedures for timber, which is based on the very practical approach followed for the ICCWC Guidelines on methods and procedures for ivory sampling and laboratory analysis.The Guide was developed by UNODC under the auspices of ICCWC, and in collaboration with a number of experts from across the globe, and provides information on forensic best practices and procedures across the whole chain of custody – from the crime scene to the court room. The Guide includes information on the collection, analysis and interpretation of forensic timber identification evidence to assist in securing successful prosecutions. “One of the most challenging issues confronting CITES in regulating trade in timber species is the identification of specimens found in trade, which is essential to determining whether the activity is legal or illegal. This unique Guide will strengthen efforts to develop and use advanced tools and technologies to address illicit trafficking of timber, which is essential if we are to combat these highly destructive crimes” said John E. Scanlon, Secretary-General of CITES. Today there are more than 600 tree species listed in the CITES Appendices from the initial 18 that where listed in 1975 and over 400 of them are found in trade – with 250 additional timber species proposed for listing under CITES at CoP 17. On 25 May, the second session of the UN Environment Assembly witnessed the launch of the One UN Campaign against illegal trade in wildlife, led by UNEP, UNDP, UNODC and CITES. 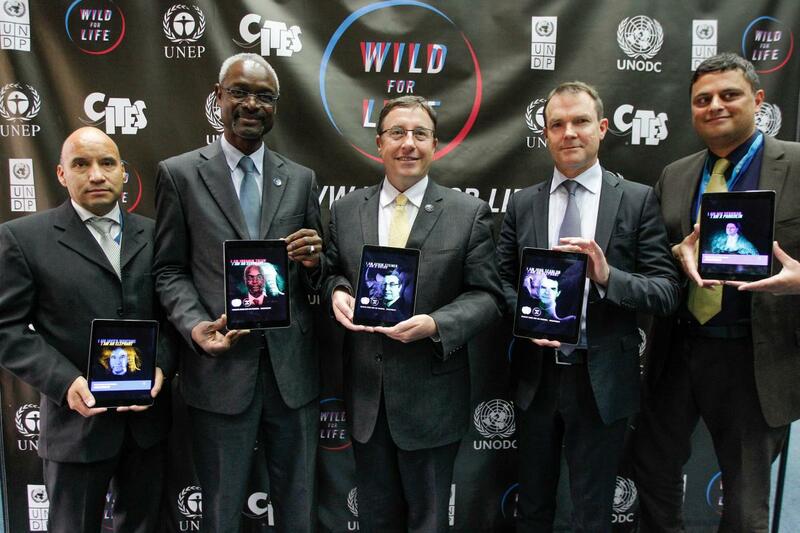 The Campaign, which was supported by messages from the UN Secretary General, Ban Ki-moon as well as the heads of UNDP, UNODC, UNEP and CITES, involves the use of UN Ambassadors as a part of a mass public awareness campaign on illegal wildlife trade, which will be followed by more targeted demand reduction initiatives. "People are the cause of this serious threat to wildlife and people must be the solution, which requires us to tackle human greed, ignorance and indifference. We must go hard on enforcement to confront the greed and reach out to hearts and minds of the people to overcome ignorance and indifference. This UN and CITES campaign can help inspire the masses to protect our most precious and vulnerable wildlife from being driven to extinction through illicit trade” said John E. Scanlon, CITES Secretary-General. Mr. Scanlon also participated in a High-level Panel session moderated on illicit wildlife trafficking in the margins of the UN Environment Assembly. On World Environment Day 2016, being hosted by Angola and revolving around the theme of illegal wildlife trade, further reports will be released, including a report by UNEP on the first analysis of the environmental impacts of illegal trade in wildlife. The 17th meeting of the Conference of the Parties to CITES (CoP17) - the World Wildlife Conference - will take place in Johannesburg, South Africa from 24 September to 5 October 2016.CITES decisions determine the international rules governing trade in wildlife. A record 175+ documents proposing new measures and policies on international trade in wild life were submitted by the 27 April deadline for consideration at CoP 17. The agenda includes a vast array of issues, including bringing new species under CITES trade controls, changing the current status of existing CITES-listed species, supporting legal and sustainable wildlife trade as well as a broad range of measures to tackle illicit wildlife trafficking, such as fighting corruption, enhanced enforcement, targeted demand reduction and supporting local livelihoods.